Tenko consistently excels in its depiction of the complexity of human emotion and motivation and this is nowhere more the case than in the portrayal of the enigmatic Dorothy Bennett. Here, as the girl from Edgware bows out of the series (for the time being), the hugely talented Veronica Roberts once again has the welcome opportunity to flesh out this highly unpredictable – but eminently likeable – character, as Dorothy’s journey of self-discovery reaches a very true conclusion. Elsewhere, Marion continues to find her new life with Clifford an exercise in endurance, Beatrice seeks to come to terms with the deterioration of her eyesight, and the newly arrived Sister Ulrica once again struggles with the denial of self. These plotlines all come together to form a particularly emotional episode in which the performances of the leads and Anne Valery’s beautifully lyrical script hit exactly the right tone. 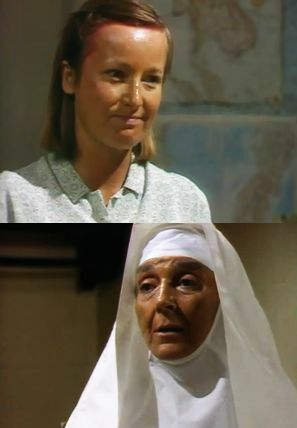 In Tenko’s second series Sister Ulrica advised a distraught Dorothy that life is longer than she imagined and this episode seems to prove it, as by its conclusion she appears to be completely reborn as she makes plans for her new life back in England. However, in this one episode alone she has to go on quite a journey in order to reach this point. She starts the narrative fortified by Ulrica’s return and, following her run-in with Madge and company, determined not to ‘turn tail and run to God knows where.’ However, she is to become unstuck on both counts. For one thing it transpires that Ulrica will not be around to guide her for long, and for another, underneath it all – just like her mother – she does care what the neighbours think. Indeed, in retrospect, her ‘I am what I am… take me or leave me’ speech to Ulrica sounds like nothing more than a desperate attempt to convince herself. It is fascinating that Dorothy is seen to put such store by her time in the camps, even going so far as to declare that: ‘In no time it will be like the old days!’ countering Ulrica’s question: ‘Were they so very precious?’ with the view that: ‘Bits were, the closeness and the friendships. Us against the rest!’ It is as if Dorothy is using her experience in camp as justification for her default ‘against the world’ setting: ‘They’re still out there, you know. 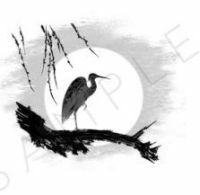 Waiting for someone to trip up…’ a stance which, as Ulrica wisely observes, helps hide her insecurities and allows her to lash out at anyone including do-gooders like Phyllis Bristow. Although, to be fair to Dorothy, Phyllis does have it coming with her achingly patronising suggestion, after Agnes lodges her complaint, that she should go home as: ‘At least there you’d have the guidance of your mother.’ Phyllis thinks this is for Dorothy’s own good, but naturally that only makes her more determined to dig her heels in. As an aside, that it is the previously unknown ‘Agnes’ who lodges the complaint against Dorothy is very strange. Why not Madge, Enid or Cherry after the way they were rather clumsily shoe-horned into the previous episode? A key turning point for Dorothy is the news that her mother was killed several years previously. Somehow the manner of her death seems as comically fitting as Dorothy’s ‘doilies and dainties’ description of her: ‘Bombed in the paper shop together with Mr Bright.’ We already know that Ulrica was more of a mother to Dorothy than her real mother ever was, so it is no great surprise that she doesn’t immediately react with floods of tears, however, it is not too long before her guard comes down. We see another side to Maggie in the scene in question as she makes some surprisingly insightful observations, firstly recognising that Dorothy’s tears are about her mother rather than Violet, and secondly, the idea that: ‘Nagging’s one way of loving, ’specially if you don’t understand someone.’ The cheerful follow-up comment: ‘You are a bit of a mystery even to me,’ chimes with the series’ audience who have found it similarly difficult to keep up with Dorothy’s thoughts and feelings. Roberts’s delivery of Dorothy’s lines about her mother talking at her (‘Do this, do that. Oh Dorothy, how could you?’) and her expressions (‘that was “not being very nice”’) are wonderfully naturalistic, as is her heartfelt cry as she finally breaks down and calls out ‘Oh Mummy!’ and her considered intonation of the word ‘home’ after Jake’s arrival cuts her tears short. This is an excerpt from Andy Priestner’s acclaimed book Remembering Tenko in which this episode is reviewed in full. The book also explores and details how the series was made and boasts hundreds of behind-the-scenes photographs. You can purchase Remembering Tenko on Amazon. As the final series reaches its halfway point, it is Marion who becomes the focus of the narrative as we witness her initially joyful reunion with husband Clifford, but also her subsequent dismay at his lack of understanding of her needs and what she has endured. The tensions between the married couple are played out sensitively and believably by Ann Bell and Jonathan Newth as Marion almost immediately finds herself trapped in a life that she did not want before the war and is even less able to suffer now it is over. Clifford’s return also causes emotions to run high amongst the other women as his new war crimes role prompts the first debates over Yamauchi’s guilt, a matter on which the women can never hope to agree. Elsewhere, Beatrice’s hopes that she will resume her pre-war job are horribly dashed and, as the doctor reacts to the news, Stephanie Cole once again threatens to steal the show with her performance. Looked at in its entirety, Tenko is arguably Marion Jefferson’s story more than it is that of any other character. The first series began with her frustration with a superficial existence in the polite society of pre-war Singapore and the subsequent gradual realisation of a very real and rewarding purpose in the unlikely surroundings of a Japanese prison camp. Although a few episodes in the second series saw her take an occasional back seat, with the notable exception of Beatrice, Marion’s experiences and reactions have been explored in the most detail, and arguably with the most care, throughout. It is only right then that her long-sought reunion with Clifford and her uneasy resumption of the role of army wife and the attendant complex emotions become almost the sole focus of this particular episode. That night, apart from the obvious problem that Clifford is unable to ‘perform’, there is further indication that there is trouble ahead as Marion fails to communicate her concerns about leaving Raffles and therefore her friends behind so soon. 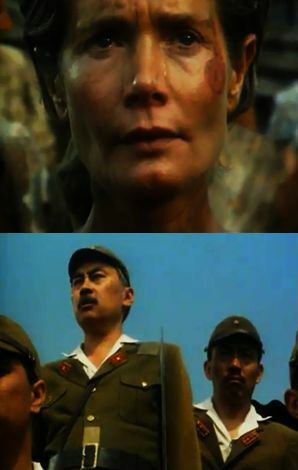 Typically for Tenko this isn’t explicitly spelt out (as it might be in a less sophisticated drama) and instead is merely implied by Marion’s unfinished sentences as it clearly dawns on her what being reunited with Clifford means: separation from the others, a circumstance she has not begun to prepare herself for. This episode is most notable for the introduction of two new male characters, the cantankerous Stephen Wentworth and the smooth-talking Jake Haulter, who are set to make a significant impact on the remainder of the series due to their interactions with the former internees. Both are superbly well-judged additions to the cast. This is partly down to the considerable acting talents of Preston Lockwood and Damien Thomas respectively, but also because their presence deepens our understanding of established characters, Joss and Dorothy in particular. On first sight Stephen Wentworth immediately puts us in mind of Joss. For one thing his first line is Joss’s familiar old refrain requesting the whereabouts of one Monica Radcliffe, for another they have a similar beanpole build and looks. As we observe the pair becoming acquainted, further shared traits become obvious. Apart from the fact that they both counted the late Monica as a very close friend, like Joss, Stephen is clearly of ‘good stock’ and just as unwilling to allow his class to get in the way of what he wants to do – in his case, helping those less fortunate than himself, a mission which neatly correlates with Joss’s own passion for social reform and left-wing politics. His suggestion of splitting a bottle of brandy as a way of saying farewell to Monica is also very ‘Joss’. Indeed, the similarities between the pair become so striking that ‘a male Joss’ serves as a perfectly fulsome description for this former Changi inmate. 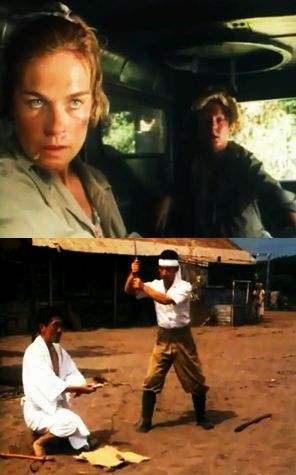 However, the marked and important difference between the pair is the fact that, despite the ravages of imprisonment, Stephen is still gung-ho about his philanthropic project to help the poor of Singapore, while Joss is less than convinced that she has sufficient stamina to become involved (‘I’m past it!’), a concern which will ultimately prove to be well founded. What is not immediately obvious here is the pivotal nature of the scene shared by Joss and Stephen at his digs as, over a photograph and a bottle of brandy, the Monica Radcliffe Foundation is born – a significant component not only of the remaining episodes of the third series but also of the subsequent Reunion special. Once again Tenko’s deft plotting sees a supposedly immaterial, and occasionally irritating element of the series (the persistent question of the fate of Monica Radcliffe) earn its place. Wheeler-dealer Jake Haulter stands in complete contrast to Stephen Wentworth. The silver-tongued rogue fulfils several functions in the narrative. Most obviously he provides romantic interest as he charms his way into the affections of the former internees. Joss happily admits that on their first meeting she failed to resist his wicked grin; Maggie as good as throws herself at him; while Beatrice is clearly both delighted and flattered when he describes her as ‘a brick.’ However it is Dorothy, who seems more immune to his charms, who Jake has in his sights from the off. Although it is much less pronounced in this case, just as with Stephen and Joss, Jake also mirrors Dorothy. As well as both being determined survivors with hidden depths, Dorothy also shares Jake’s head for business. Perhaps Jake consciously or subconsciously recognises Dorothy as something of a kindred spirit? Jake’s much less obvious function in the narrative is to provide information about chaotic and colourful post-war Singapore. Due to his ‘finger in every pie’ approach Jake knows about anything and everything that is going on there and as such is the perfect mouthpiece for background exposition, be it about furniture reclamation or the surprising fact that the Allies have recruited Japanese soldiers to help them. It is worth mentioning that it is pretty much impossible to dislike Jake. We imagine that he has a shady past with several ‘skeletons in the cupboard’ and it is obvious that his current actions are at least partly motivated by self-interest, but there is still a definite sense that he is decent and that his heart is in the right place. It is no accident that, as the women fly back towards Singapore and an uncertain future, the very first word spoken here is ‘scared’. Throughout this episode, the gradual realisation that the women will find it very difficult to rebuild their lives – the central theme of this final series – is sensitively detailed for the first time. The ensemble cast predictably rises to the occasion as the women begin to appreciate that freedom is a far more complicated prospect than they might have imagined. The women’s arrival at the airport and the reception which follows are far too much for them to take in at once, and their wonderment at the ordinary trappings of their pre-war existence such as cups and saucers, soap and biscuits are particularly well conveyed. Not only do they talk about these items in such excited tones (‘My very own piece of soap!’) but they respond with all their senses – smelling, touching and eating, scarcely able to believe that what they are experiencing is real. Considering their recent living conditions it is unsurprising that they find their new ‘digs’, Raffles Hotel no less, as equally astonishing, and they variously describe it as palatial, sparkling and ‘bloody heaven.’ Even the hemline on the dress of a passing woman in the hotel prompts them to gasp in amazement, making them realise that the world has moved on while they have been in captivity. Joss’s quip that she feels like Rip Van Winkle is highly apposite. The marvels continue unabated as the women sit down at a ‘real table’ with a ‘real tablecloth’ with ‘real cutlery’ to eat good ol’ bangers and mash, and are furnished with Singapore Slings into the bargain. The fact that the women polish off the meal in seconds rather than minutes and the unadulterated joy on their faces as they do so, are the sort of details that this episode does so well. There is, however, a much darker side to all this new luxury, and this is emphasised by some of the reactions of the women to their new existence. We observe Dorothy palm a pile of digestive biscuits (and later a cruet and an ashtray), Alice pack away her plate amongst her belongings without thinking, and Marion start a second letter to Ben after she realises that she no longer needs to conserve paper (taking great joy in scrumpling up and discarding her first draft). On one level these moments underline the fact that old habits die hard, however it goes much deeper than this. 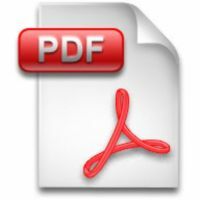 Marion may eventually learn to automatically set out a letter in a normal fashion again and Dorothy may reach a point at which she no longer feels she needs to steal, but these are just rather inconsequential and superficial manifestations of their scars. What this series will go on to detail is that captivity has irrevocably and permanently altered the very characters and personalities of these women, so much so that they can never hope to fill the same roles in society or react to the world around them in the way they did before the Japanese invasion. Dorothy, for example, now realises that while she was happy to let Dennis make decisions for her before the war, now she needs to be in control, shaping her own future. 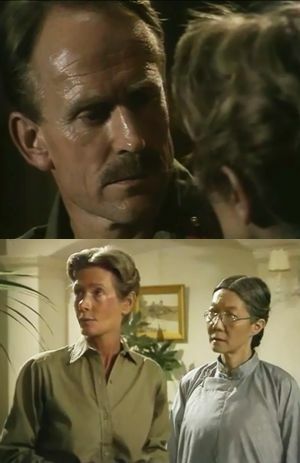 It was a beautifully judged decision on the part of Lavinia Warner to bring the series ‘full circle’ by returning the women to Raffles, the setting for much of Tenko’s first two episodes. As the hotel has been talked about so nostalgically and longingly by the women during their internment, the place is now imbued with an almost mythical quality which accentuates perfectly the unreal and dreamlike feel of their new-found freedom. However, even Raffles quickly loses its initial shine, as Dorothy remarks how shabby their room, with its peeling wallpaper, looks in daylight. The dream is to her mind quickly broken. At the evening dinner dance, Marion and Kate, who were present at Raffles for the 1942 New Year celebrations, cannot help but both be reminded of the last time they were there, with Marion describing it as: ‘New Year’s Eve before the Fall.’ She adds that this ‘makes it sound like the Garden of Eden.’ Mindful of how much the camps have changed their lives, Kate’s response: ‘Perhaps it was,’ is left hanging meaningfully in the air. For Marion, the chief adjustment she has to make here is her acceptance that she is no longer the leader of the women she is with and that she must try to curb her now natural instinct to organise and discipline them. Maggie, for one, tells her in no uncertain terms: ‘You’re not our leader now, you know, nor our conscience!’ Although Marion seems to accepts this, it cannot suddenly stop her caring for the women who have been in her charge for so long, and when she later observes Dorothy stealing an ashtray she makes a point of saying that although ‘it’s none of my business’ she still wants to understand why. 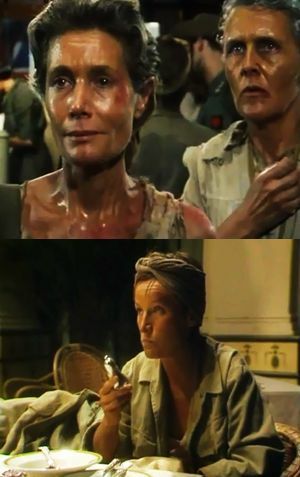 The close of this scene, in which Marion reminds Dorothy that she was ‘on look-out for all those years,’ also makes it clear that despite the privations they endured the women will come to look back on their time in camp almost affectionately. Ann Bell’s performance is notable here for the care she takes to show that Marion is not in the best of health – coughing before she digs in to her bangers and mash, and almost hyper-ventilating at the first sign of clean paper and a writing desk. After the climactic conclusion to the preceding instalment, this episode deals with the difficult period which immediately follows, in which the women have no choice but to remain incarcerated in camp under ‘Japanese protection’ but are no longer official internees. The distinction is somewhat lost on the majority of the women, who are understandably less than enthusiastic about the prospect of having to endure extended captivity. Kate’s feelings on the matter are representative: ‘When he said the war was over, I just imagined I’d be free. I’d be with Tom in a matter of hours. So frustrating.’ In dramatic terms, the women’s interminable wait – which naturally for Tenko is historically accurate – affords further examination of the series’ Japanese characters and of the uncertain future that awaits the surviving women. Picking up precisely where the last episode left off, the opening sequence concerns Marion’s prevention of an attack on Sato led by Maggie. 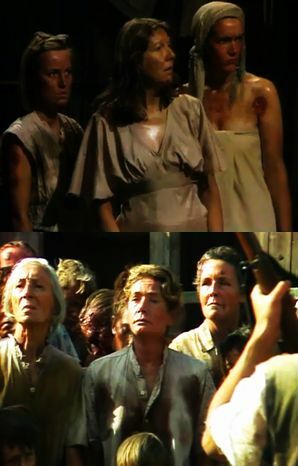 Although Maggie curses Marion for her interference and initially talks about wanting to enjoy torturing Sato, it is patently clear that neither she nor the other women present are capable of meting out revenge to their former captor, regardless of the suffering and death he has inflicted. As Maggie later admits to Alice: ‘It wa’n’t Marion who stopped us.’ Maggie’s declaration that she wishes that she could have taken Kasaki’s role in Sato’s hara-kiri is also empty bravado. However, while the women may not be able to exact revenge, they are absolutely determined that they will no longer be treated like prisoners – even Alice protests aloud about drain duties – and the concessions that Marion has agreed with Yamauchi mark the first material turnaround in their fortunes. Dorothy receives some fascinating development as she is presented as the only woman in the camp reluctant to leave its confines, especially once they are able to barter with traders for food. As she states aloud: ‘It’s not that bad here now. We’ve got food and fags. They leave us alone.’ Being left alone is clearly what Dorothy desires most of all, presumably because she can neither face nor contemplate a better alternative in the outside world. Her decision to stay put rather than join the others as they race to meet the Allies and her distracted demeanour as the ‘poached egg’ is lowered says it all. The question remains: when it comes to the future, is Dorothy more realistic or just more pessimistic than her fellow survivors? Fittingly enough, it is a certain aspect of Dorothy’s character, as presented here, which will directly contribute to the gradual rebuilding of her life: her natural aptitude for trade and business. Before now, of course, Dorothy has been very successful in selling the only commodity she had: her body. Upon discovery of the storeroom’s material bounty, Dorothy alone sees the options now open to them, chiding Christina for thinking they can live off butter and condensed milk (although Metro-Goldwyn has a good go at the latter! ), and realising instead that they need to use it to barter for food from the natives. Dorothy’s lack of concern at the prospect of wringing the neck of the first chicken she purchases further underlines her hard-nosed practicality. Given her experiences since the Autumn of 1941, it is little wonder that Dorothy is less than ready to accept that the grass will be greener for her outside the camp and we can hardly blame her for the tentative way in which she clambers onto the lorry that will take her back to civilisation. Christina’s reaction to the prospect of freedom is the complete antithesis of Dorothy’s. Despite her treatment in camp and Yamauchi’s pointed definition of her as ‘half British,’ the Eurasian appears to optimistically believe that she will pick up where she left off, even down to the possibility of hooking up with Simon Treves again. She even manages to ignore Van Meyer’s dig that: ‘We are European women of high class – some of us.’ Where Dorothy may be too pessimistic, it seems distinctly likely that Christina is far too optimistic and appears to have learnt little from her time in captivity. The third series opens with an episode which initially seeks to document the ongoing day-to-day captivity of the women now that they have been interned for almost three-and-a-half years. However, the emphasis suddenly shifts halfway through to the question of the women’s immediate survival as the narrative builds towards a nail-biting last tenko at which they ready themselves to fight for their lives. Instead the women are to discover that the war is over and long-term viewers are finally rewarded for their loyalty as the prisoners celebrate and Marion takes charge of the situation. The direction, scripts and performances are accomplished as ever, with Ann Bell and Stephanie Cole in particularly fine form. However, it is not all plain sailing as several elements arguably detract from this opening instalment. Most unfortunate of all is the discovery that the much-loved Blanche, who was always played with such vigour and charm by Louise Jameson, is no longer part of the action. Worse still, we learn of her death courtesy of a quick camera sweep across the camp’s burgeoning graveyard. It is hard not to feel cheated by the abrupt way in which Blanche has been written out of the series, simply because she was such a big character who viewers had come to invest in emotionally. However, her absence from this third series may well hit the new DVD audience harder than it did the audience of 1984, as for the former, who do not have to wait two years between series, it is only a matter of two episodes ago that the equally colourful Rose was killed off. At least in Rose’s case there was a carefully handled on-screen exit. Of course, Blanche’s absence and the need for her off-screen death (due to Jameson’s unavailability) was beyond the production team’s control. Her absence is made harder to bear especially as it is fairly obvious that her persona and storyline has been transferred to the character of Maggie Thorpe. Thankfully, Lizzie Mickery, who plays Maggie, is a fine actress who takes on the role with appropriate gusto. Maggie’s response to Edna’s wish that Alice has a happy birthday (‘Fat chance!’), her exaggerated conducting of the women as they sing a birthday chorus, and her sudden decision to go after Sato (‘Oh no you don’t!’) are all very ‘Blanche’. Fortunately, as the series progresses, Mickery and the writers succeed in establishing Maggie as a character in her own right, but it has to be said that in these early episodes it takes some time for her to shake off the spectre of the outspoken Londoner. The discovery that Verna, Daisy and Suzy have died as well is also disappointing. In Daisy’s case this is no real surprise given that she received such extensive injuries in the series two finale, while in Verna’s it was probably felt that her storyline had run its course. Cindy Shelley makes a strong start as reserved Alice who has spent all of her adolescence in the camps, achieving a believably gauche and naïve demeanour for the formerly privileged teenager. Comparing Alice with the mentally-challenged Daisy and the much younger Suzy, it is easy to see why she was introduced instead. Alice was set to be a more straightforward player in the unfolding story than Daisy would have been, and the sexual naivety storyline would have been unsuitable for the much younger Suzy. Changes of personnel aside, the sheer amount of time that has passed since the end of series two is also a jarring factor. Over the first two series we followed the women’s first 18 months in captivity, from February 1942 to September 1943, but here we are suddenly forced to accept that we have missed almost two more years of their internment (unfortunately Joss’s dialogue about the women having spent over two years in this third camp cannot be correct as the Area Three camp was bombed only twenty months previously). 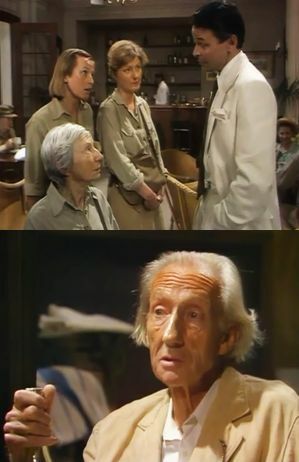 Although there is no question that the gap in the action engenders a feeling that we as viewers are ‘late to the party’, it is nevertheless eminently sensible that the third series fast forwards to the war’s end here, as it would have been difficult, misguided even, to attempt to wring original drama out of yet more episodes set in the camps. By choosing to move beyond captivity and follow the women as they come to terms with their freedom and seek to rebuild their shattered lives, Tenko is about to enter new, and exceedingly rich, dramatic territory which will more than make up for the gap between series. However, before the narrative can go off in this new direction, it must first wrap up the story of their internment and it does so admirably. Given that it is the finale of the second series, this tenth episode begins in relatively inconsequential fashion as day-to-day inanities of camp life come to the fore, such as petty thieving (biscuits and looking glasses), hospital visits, dirty drains and Joss’s latest plans for ‘nipping the Nips.’ Thankfully the narrative heats up in its second half, as the corrupt administration plotline, which has dominated the second series, finally reaches its conclusion and Verna and Miss Hasan are set to receive a comeuppance which promises to be cathartic to loyal viewers. However, it is an Allied plane which brings the series to a thoroughly unexpected cliffhanger; an ending which is all the more surprising when one considers that this could easily have been the very last Tenko episode of them all. Set in September 1943, some 20 months into the women’s captivity, one of the main concerns of the narrative is to illustrate how conditions within the camp have deteriorated. Beatrice and Kate are overrun with patients in the hospital (‘They’ll be hanging from the rafters next’) and there is a new quota for admissions. Due to the fact that more of the women are working at the factory, the compound is looking more rundown and the drains are filthy. Even the guards’ uniforms are more ragged and dishevelled. However, it is the sight of the previously immaculate Verna with sores on her face and lank, unwashed hair which really drives the message home that things are not what they were. As a consequence of these reduced circumstances, the mood in camp is very black indeed and it seems that the captors are just as miserable as the prisoners, regularly acting out a ‘pecking order’ of misery (as described by Joss to Mrs Van Meyer): ‘Yamauchi demands more production, takes it out on Sato, who takes it out on Hasan, who takes it out on Verna, who’s foul to everyone!’ A dirty drain provides the perfect opportunity to illustrate this chain which ultimately sees the women’s self-serving leader bear the brunt of Miss Hasan’s fury. Although she continues to enjoy the luxury of stuffing her face full of chocolates, Miss Hasan still spends the majority of the episode in a state of incandescent rage. There is some not inconsiderable pleasure to be had in witnessing her bad temper as it transpires that she (accurately) traces the point at which the camp started to fall apart back to the arrival of Marion and the other women from the first camp. It is deeply satisfying to know that the new intake have caused her so much trouble, despite their status as mere prisoners. That she despises Marion particularly – ‘But then I’ve always mistrusted women like Mrs Jefferson. With her ‘oh so polite’ manner’ – vindicates our belief in her as the women’s rightful leader. Despite the fact that Marion has had no official status in this second camp she has still demanded the attention of her captors and gamely fought for the rights of her fellow prisoners. Verna’s reaction to Miss Hasan’s observation that, in Marion’s case, pride will come before a fall: ‘Not always,’ suggests that she, at least, has accepted that Marion is a force to be reckoned with. Of course, by the episode’s end, Marion proves Verna right by finally succeeding in discrediting her. As Verna’s downfall has been so long in coming, its dramatisation is all the more gratifying. It is no accident that throughout the episode the store cupboard key sits more visibly around her neck, nor that her fingers fitfully play with it, as the question of the missing Red Cross parcels looms ever larger. However, before we get to the point at which Verna is forced to account for her crimes in front of the women she has wronged, we are party to yet more evidence of her selfishness. Her treatment of Daisy here is particularly abominable given just how afflicted the girl is with terrible blisters all over her hands. Verna shows no sympathy whatsoever for her terrible predicament, just obvious disgust. And to make matters worse, she even has the audacity to tell Daisy, while sat stroking Pudding, that she is having to work ‘more than most’ these days. Worse still, even if Daisy was physically able to clean Verna’s room to the required standard, she has no means of paying her. As Miss Hasan is demanding immediate payment of the money she is owed, Verna effectively has Daisy working for nothing. When Verna later gets it in the neck after Daisy fails to post up a new rota, she ruthlessly lays into the girl, actively seeking to destroy any comfort she might have derived from her association with the women in Marion’s hut: ‘Like you? They’re just using you! Only you’re too stupid to see it. Too bloody stupid!’ When Daisy reacts, as well she might, by smashing a china cup, Verna turns the situation, as always, to her advantage, stating that it is now she who owes her money.